OMEGA re-introduced its iconic Speedmaster Mark II chronograph, an evolutionary timepiece for a new generation of watch collectors. The OMEGA Speedmaster Mark II chronograph made its original debut in 1969 sharing a special historical first – man’s flight to and walk on the moon. The new Speedmaster Mark II chronograph celebrates its triumphant return for a new generation. OMEGA Speedmaster Mark II chronograph invite a new generation of watch collectors to experience a timepiece that marked man’s first historical flight to the moon aboard the Apollo 11 and his first steps on the lunar surface while wearing an OMEGA Speedmaster Professional chronograph (worn by famous astronaut Edwin “Buzz” Aldrin). OMEGA introduced the iconic Speedmaster Professional Mark II chronograph in 1969 which housed a hand-wound caliber 1861, the same movement found inside the Moonwatch. Nearly 45 years later OMEGA re-introduces its innovatively re-designed Speedmaster Mark II chronograph with a streamlined case, an evolved automated movement and for the first time in the history of the Speedmaster collection, an illuminated tachymetric scale for easy readability in dim light. OMEGA Speedmaster Mark II chronograph is presented in a polished and brushed stainless steel barrel-shaped case with polished crown and pushers and matching stainless steel bracelet. The matt black dial (Ref. 327.10.43.50.01.001) showcases three sub-dials: a 30-minute recorder at 3 o’clock, 12-hour recorder at 6 o’clock and small seconds sub-dial at 9 o’clock. The tachymetre scale is transparent and is on the sapphire crystal, which is illuminated below by an aluminum ring filled with Super-LumiNova. 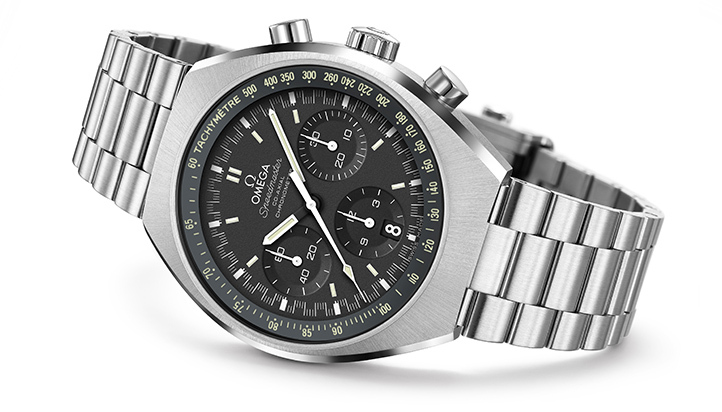 Speedmaster Mark II chronograph is also available in a grey dial version (Ref. 327.10.43.50.06.001) and is accentuated with fluorescent orange central chronograph, seconds hand and matching minute. The new OMEGA Speedmaster Mark II houses a Co-Axial caliber 3330, a self-winding movement which is equipped with a Si14 silicon balance spring as well as a column-wheel chronograph mechanism. It is water resistant up to 330 feet and comes with a full four year warranty. 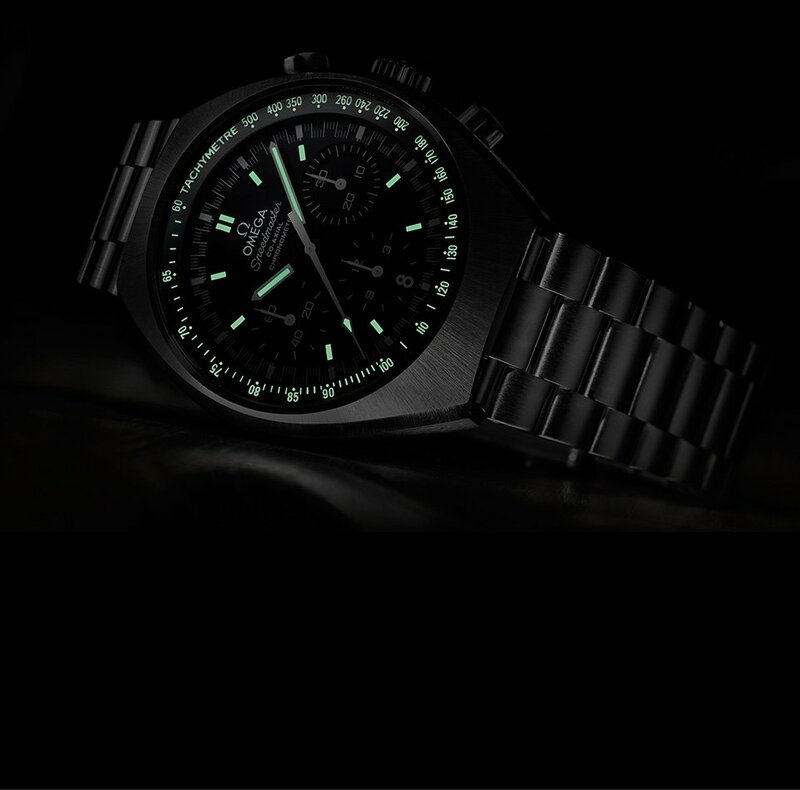 A selection of OMEGA watches are available on watchesonnet.com. OMEGA celebrates its prestigious Official Timekeeper title for the 2014 Olympics with three special limited edition watches inspired by the Winter Olympic Games. OMEGA has captured the spirit of the Winter Olympic Games in three incredible limited edition watches to commemorate the 2014 Sochi Winter Olympic Games. These special limited edition watches capture the competitive spirit of sportsmanship demonstrated by Olympic participants, and also honors the Russian Federation flag (colors of blue and red), cleverly displayed on the bezels and/or dials of the watches. OMEGA Seamaster Planet Ocean 45.5mm sports its Olympic muscle with a 45.5 brushed and polished stainless steel case with matching bracelet. Diving devotees will appreciate the time honored Seamaster Planet Ocean 600M design: unidirectional rotating bezel fitted with a matt black ceramic ring, with minutes 1 through 5 lacquered in blue and minutes 6 through 10 lacquered in red, (minutes 11-15 are lacquered in silver). The caseback features a brushed screw-in caseback which is embossed with the “Sochi 2014” Olympic logo, engraved with “Si14” and the limited edition number (0000/2014) and includes a helium escape valve located at 10 o’clock on the case. OMEGA Seamaster Planet Ocean 37.5 mm “Sochi 2014” unveils its Olympic spirit in a 37.5 mm brushed and polished stained steel case adorned with a beautiful winter white leather watch strap. Women will revel in this diver’s watch’s white ceramic unidirectional rotating bezel, which also displays the Russian Federation flag colors at minutes 1 -5 lacquered in blue, and minutes 6 through 10 lacquered in red. Like the men’s Seamaster Planet Ocean watch it too has a brushed screw-in caseback embossed with the “Sochi 2014” Olympic logo and engraved with “Si14” and the limited edition number (0000/2014), as well as a helium escape valve located at 10 o’clock on the case. OMEGA Sochi Petrograd brings home the Olympic gold in a polished 18K yellow gold tonneau shape case complimented with a stunning burgundy leather strap. Sochi Petrograd silvery dial also sports the Russian Federation flag colors with an outside red 24-hour track and minute hands fashioned from blued steel. The black sub-dial at the 6 o’clock position also has a blued steel seconds hand and matches the black 12-hour track. Sochi Petrograd is powered by OMEGA’s exclusive calibre 2202 with a Co-Axial escapement and special luxury finish (100 pieces are to be produced). These special limited edition watches not only reflect and celebrate OMEGA’s 26 years as the Official Timekeeper of the Olympics, but also pays tribute to this years’ Olympic host of the Sochi Winter Games – a time honored achievement for OMEGA. From its original release in 1970 to its relaunch in 2009, the Omega Seamaster Ploprof 1200M 224.32.55.21.01.002 has captured attention as an amazingly functional professional divers watch. But you don’t have to be a diver to appreciate the high-tech of this legendary timepiece. Professional divers across the globe were using the original version of this watch, the Seamaster Professional 600M, an entire year before it was released to the public. Eventually, the watch was renamed the “Ploprof,” an abbreviation of “plongeur professionnel,” a French term for “professional diver.” This seaworthy creation became a true underwater force with the integration of Omega’s Co-Axial technology in 2009. With every feature of the watch serving a vital diving purpose, this watch is a creation of truly professional quality. One of the most noticeable features of this timepiece is its strong geometric shape. The intriguing steel case isn’t only for visual appeal; it serves a function as well. The crown’s location at the 9 o’clock position allows for unrestricted wrist movement and avoids accidental rotation. When unscrewed and released from the protective buffer, the crown can adjust date and time. The hour hand can be adjusted separately to allow for daylight savings and time zone adjustments. A locking system prevents the bidirectional rotating bezel from being inadvertently moved, allowing a more accurate measurement. To release the bezel, an orange anodized aluminum pusher is located at the 2 o’clock position. At the opposite end in the 4 o’clock position is an automatic helium escape valve which aids in decompression. A polished, lacquered black dial and matching bezel are boldly contrasted with the rest of the watch. Divers frequently rely on the bezel and minute hand during their excursions, and the Ploprof designers have taken this into special consideration. The bezel is uncluttered and easily read, while the minute hand is oversized and outlined in orange for easier visibility. For additional visibility needed in the ocean’s depths, the hands and dial indexes are coated in phosphorescent Super-LumiNova. What most sets the Ploprof 1200 M apart from the original 600 M is its water resistance and addition of the Co-Axial technology. While 600 meters was already an incredible water resistance, the new Ploprof’s 1200 meter water resistance ensures that this watch can withstand the extreme pressure that accumulates below the ocean’s surface. The Co-Axial Escapement within the self-winding movement is acclaimed for its stability, precision and durability. Another robust addition is the orange rubber strap which adds a vibrant touch to the timepiece as well as a more comfortable fit on your wrist or wetsuit. The Omega Seamaster Ploprof 1200M is clearly designed for a certain purpose, and though each feature has been admirably designed, the watch as a whole may not be a necessary item for the casual purchaser. But it still makes for a visually striking, sturdy wristwatch for the non-diving population. Even if you’re not a diver you can appreciate the technicality of this watch and how every detail serves a unique purpose. The Omega Seamaster Ploprof 1200M 224.32.55.21.01.002, available here, is an all-encompassing, truly professional watch. High fashion meets exceptional machinery in the Omega De Ville Ladymatic 425.65.34.20.55.002. This innovative creation is an answer to women’s increasing desire to own a timepiece that is as impressive on the inside as it is on the outside. Omega originally released the Ladymatic in 1955. At that time the watch’s significance was twofold: it was one of Omega’s first self-winding watches specifically targeted to women and it marked the smallest automatic movement the brand had ever made. A 2010 revival of the inventive collection combined Omega’s touted Co-Axial technology with a chic, elegant design. The Ladymatic re-launch also elected the line’s official spokesperson, Nicole Kidman. The Oscar-winning actress endorses Omega’s ability to recognize that women are as interested in quality as men are. As the line’s Ambassador, Kidman believes the new Ladymatic perfectly addresses women’s interest in timekeeping performance. The heart of the impressive inner-workings of this timepiece is the Omega Co-Axial caliber 8521. The Co-Axial escapement and exclusive silicon balance spring contribute to the precision and durability of the self-winding movement. As a COSC-certified chronometer, this watch further demonstrates its superior timekeeping capabilities. Additionally, the Ladymatic reduces winding time by automatically winding in both directions and has a power reserve of 50 hours. The scratch-resistant sapphire covers the dial and transparent case back, exhibiting the movement’s exclusive, lavish finish: Geneva waves in arabesque. Impeccably designed, the Omega De Ville Ladymatic 425.65.34.20.55.002 easily appeals to a woman’s fashionable side. Most alluring are the diamond accents and stunning white mother-of-pearl dial. A halo of sparkling, snow-set diamonds adorns the bezel while 11 gold-mounted diamond indicators circle the dial, accompanied by a polished date window at the 3 o’clock position. A swirling supernova pattern spirals from the center, where a pair of golden, alpha-shaped hands rest. With a Super-LumiNova coating, the Ladymatic watch hands are sure to be beautifully luminous even in the dark. The titanium inner casebody rests in an 18-carat yellow gold case and the matching metal bracelet secures with a butterfly clasp. And finally, the screw-in crown set with a lustrous diamond completes the accessory, its self-locking feature enabling a water resistance of 100 meters. If this particular design doesn’t fit your fashion sense, there are dozens of other combinations in the Ladymatic collection. If you’d like a slightly less dressy watch for half the price, a fitting alternative is the polished bezel model with a leather alligator strap. Omega’s interplay of the different metals, colors, dials, embellishments and bracelets make it easy for you to find a model that precisely fits your style, from simple to stately and everything in between. Omega has successfully reinvented their product in a way that provides an essential upgrade, yet still maintains the original qualities that people originally adored. The Omega De Ville Ladymatic 425.65.34.20.55.002 is a modern, stylish watch for today’s fashionable woman. An improved, redesigned version of the now-famous Constellation Manhattan, the Omega Constellation Brushed Chronometer 123.25.31.20.53.001 is a mixture of tradition and originality and is an instantly recognizable timepiece for the modern woman. In a move that garnered recognition for the Omega brand, the company launched a distinctive wristwatch in 1982 called the Constellation Manhattan. The unique “griffes” (or claws) wrapped around the bezel left an impression on the public, and now the Constellation is one of the most easily recognized watches in the world. Omega has recently updated the collection, changing the timepiece’s features slightly for a more current look that appeals to new fans as well as its original admirers. Important features of the 1982 design are still echoed in the new Constellation collection. The subtle-yet-significant star still graces the dial at its familiar 6 o’clock position. The horizontal links of the bracelet have improved in comfort while remaining as visually distinctive as its predecessor. Most importantly, the new collection retains the defining griffes that have captured our attention for the last 30 years. These prominent four claws have been contemporized and are a little more refined and polished. Omega has also added a few new features to the popular design. The Constellation Brushed Chronometer has a rich blue dial with a striking seashell effect emanating from the star. In lieu of Roman or Arabic numerals, 11 brilliant diamonds surround the dial with a date window at the 3 o’clock position. Diamonds also collect around the red gold bezel like sparkling stars in the night sky. Adding to the stellar effect are the faceted, luminous hands made of 18-carat gold and coated with Super-LumiNova. These phosphorescent pigments are activated by both artificial light and sunlight, emitting an afterglow that radiates in the dark for hours. An upgrade wouldn’t be complete without improving the technology. The new design is a COSC certified chronometer—it has been thoroughly tested for precision. Omega’s designers have also ensured that each new Constellation continuously stays accurate thanks to the added Co-Axial Escapement technology. The modern collection is also equipped with a water resistance of up to 100 meters. The Omega Constellation Brushed Chronometer is a unique, identifiable timepiece that is part of a very popular family. The colored, diamond-embellished dial reflects a heavenly beauty and makes for an attractive accessory. Some women are not fond of highly-embellished jewelry. Though the bracelet is fairly simple, the decorated dial isn’t. These contrasting elements might be an ingenious pairing for some or an awkward match for others. A great thing about this collection, however, is its variety. You can find a Constellation in a variety of sizes, dials, accents and metals. Omega has done a good job of creating enough variety to satisfy most women. The designers at Omega have done a great job revamping a popular design to create this Constellation Brushed Chronometer 123.25.31.20.53.001, which is available here. This timepiece keeps the essence of the original design while incorporating more contemporary features and should therefore keep a lot of women happy.